It’s not often, in my experience, that a movie recommended to augment school learning is as entertaining, enthralling and enjoyable as Robert Redford’s historical work, The Conspirator. Combining stellar acting from many well-known actors, including James McAvoy, Robin Wright, and Kevin Kline, and an intriguing central conflict, this film was one of the best films I’d seen in theaters in a long time. 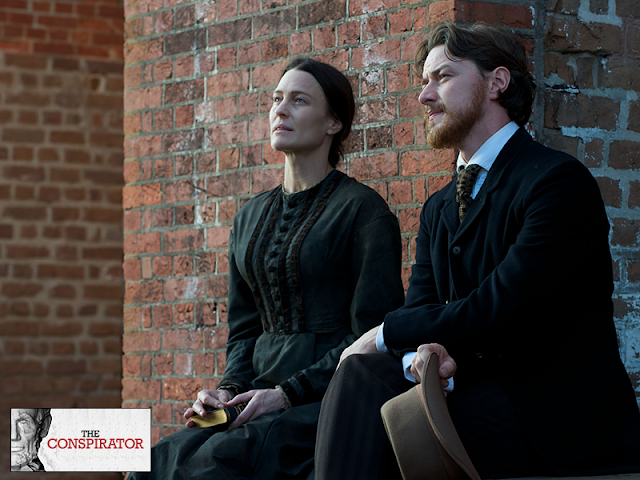 The movie focuses on the heated trial of Mary Surratt (Robin Wright), an alleged conspirator in the Lincoln assassination, and the struggle of her initially reluctant lawyer, Frederick Aiken (James McAvoy), to search for the truth of whether his client is truly guilty. Although the “guilty” verdict is already a foregone conclusion, under the sure, steady direction of Robert Redford, with the aid of dramatic background music that sets the mood of the scene and, at times, strong chiaroscuro lighting, the film builds suspense and allows the watcher to hope against hope that somehow the verdict will return as “not guilty”. The film’s opening scene sets the tone, contrasting a stark, bleak Civil War battlefield strewn with wounded and dead, Union and Confederate soldiers, with a darkly humorous joke, told by James McAvoy to his wounded fellow soldier, a sadly miscast Justin Long. The film deals with dramatic situations and issues of justice and peace while sprinkling in small bits of situational and historical humor, for the benefit of those in the know—at one point, Kevin Kline’s ambiguous, seemingly amoral War Secretary Edwin Stanton makes an aside about keeping now-President Andrew Johnson away from the liquor. James McAvoy is the protagonist, Frederick Aiken, a former Union soldier and staunch Lincoln supporter who returns from the war to his law practice under a Southern senator. Surrounded once more by fine company, friends and his young girlfriend, played by Alexis Bledel, Aiken’s world is turned upside down when Lincoln is murdered by John Wilkes Booth and he is saddled with the defense of Mary Surratt, accused of conspiracy in the murder. Reluctant to help the woman whom he deems a traitor, he is drawn into the web of intrigue surrounding the Surratt family, with Mary’s eternally loyal, loving daughter Anna (played by Evan Rachael Wood) and her missing son, John, whose involvement in the conspiracy is more pressing than his that of his mothers’. Seeking a scapegoat and a way to soothe the country’s grief, Edwin Stanton and the federal government have staged a military tribunal against Mary and several confirmed conspirators with a predetermined verdict of guilty. As the witnesses all lie to save themselves and to frame Mary Surratt and Aiken’s defense proves futile, Aiken comes to support Mary strongly and at all costs. He soon finds that his absolute defense of Mary proves unpopular as his relationships with society, his friends, and his girlfriend deteriorate, yet still he persists in his belief that Mary Surrat should receive more than the pale imitation of justice at the hands of the federal government, which is meant to stand for justice and a fair trial to all. The most emotionally moving scene occurs when Aiken has convinced Anna Surratt to save her mother by implicating her missing brother by testifying, and the judges order guards to stand between Mary and Anna, obscuring them from each other’s view. This scene ultimately lays bare the cruel acts that the government is willing to commit in order to say that they got the bad guy, so to speak. Since the story and thus the conclusion are already known to the audience, the intrigue and emotional power of the film rests on the shoulders of its cast of actors, most of who turn out excellent performances. Robin Wright, although not the protagonist in terms of screen time, is the true star of the film, portraying Mary Surratt as an innocent victim who knows more than she is willing to disclose, who is willing to sacrifice herself to save her miscreant, missing son. Agony and mystery are evident in her elegant face, and her pale eyes convey the myriad of emotions bubbling beneath the calm exterior. James McAvoy cuts a charming, dandified figure in 1860’s garb, and skillfully develops his character and his struggle to identify the real criminals in this case of the century. As his attachment to Mary grows and his determination to give her a fair trial increases, his performance becomes more riveting and engaging and the audience is practically cheering him on as he drafts a writ by candlelight, desperate to save Mary. Evan Rachael Wood combines defiance and emotional rawness as Anna Surratt, and Kevin Kline clothes his Edwin Stanton in shades of gray, playing a man who would condemn an innocent woman to save his country. Of course, as with all films, there are certain weaker aspects. The casting of such modern-looking actors as Justin Long and Alexis Bledel, even in minor roles, leaves the scenes with those characters feeling a bit uncomfortable, as if the actors are conscious that they don’t belong in a Civil War film. In addition, the uneven quality of the film, which alternates, depending on the scene, between crystal clarity and a grainy effect which would have added to the “old” effect of the film had it been used consistently throughout, is rather jarring. However, overall, the film is a triumph of storytelling, suspense and acting which I am fortunate to have had the pleasure to see. This film has my strongest recommendations. Excellent review. I agree that viewers will hope, albeit unrealistically, that the verdict comes out otherwise. I think this is in part because of the sympathetic portrayals by Wright and McAvoy and in part because of the amazing corruption behind the trial. This movie is both beautiful and ugly; above all, it is thought provoking. You have done it justice with your review. considering that period pieces are my all time favorite movie fare, and your review sets the stage for the Conspirator to be intriguing (even with the conclusion already known) by good plotting and excellent acting, I am on my way NOW!!! Thank you for an excellent review.